Try the new Flight Planning Experience! Bluetooth device for a more accurate GPS position while enroute! 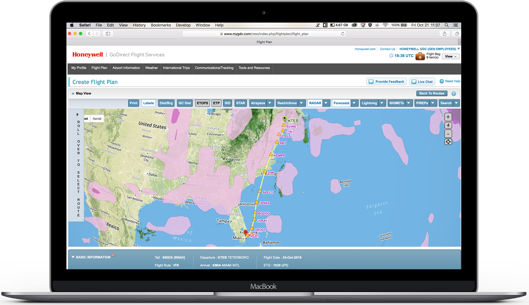 Learn More about the new Flight Planning Experience! Our team will monitor your aircraft through every phase from pre-flight to post-flight. We provide access to worldwide, up-to-the minute aviation weather. Real-time, reliable communications from the ground to your aircraft. We will help obtain your eAPIS filings, permits, ground handling and much more. Quickly and easily get access to technical publications, videos and training. We make it fast and easy for you to get the updates you need for your avionics. Delivering high-speed satcom voice and data at altitude. 2016 © Honeywell International Inc.